This collection includes stories previously published in the acclaimed Paraspheres and Bending the Landscape anthology series and in Asimov’s SF, as well as one hundred pages of previously unpublished work. "L. Timmel Duchamp's stories are intense, tricky, heartfelt, and most of all, interesting; they take on big themes in a clear way, but also at the same time swirl with complications, moments of poetry, life itself." "L. Timmel Duchamp has become a major voice as an editor, publisher, and critic. 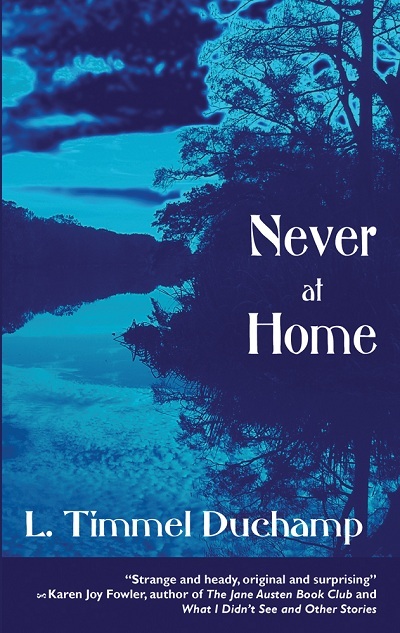 Her new collection Never at Home confirms her importance as a writer as well. The stories within are strange and heady, original and surprising. In them, the Duchamp heroine often finds herself pulled into some fascinating new world. The Duchamp reader is in the same position, though much happier to be there. Highly recommended." "A new collection from L. Timmel Duchamp is cause for celebration. Duchamp's short fiction is compassionate, sharp-eyed, intelligent, and often ingeniously structured. These stories take us places we haven'tt been before. Never at Home once again showcases a unique, essential voice."